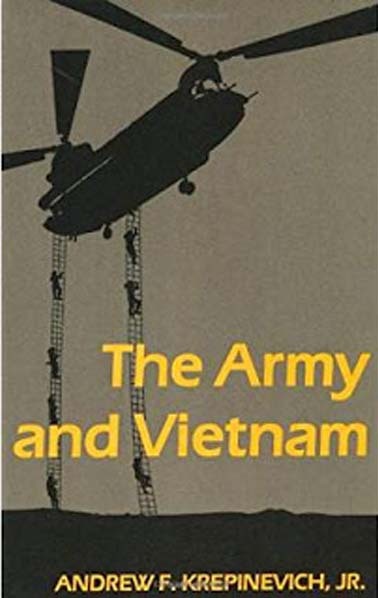 In 1986, Andrew Krepinevich, then on the faculty at West Point, published his devastating critique of the ignominious American defeat in South Vietnam. It was then 14 years since the retreat, and Krepinevich thought that the Army had never learned why it was so badly beaten. Within less than 20 years, Krepinevich was proven to be a prophet and the Army lost two more wars, ignominiously. Firepower and aircraft turn out to be useless in a place where the population is disaffected or indifferent and the local government is corrupt/incompetent (which is why the populace is disaffected). The Army doesn’t have any infantry. Its so-called infantry divisions have more tanks than World Wr II armored division. Plus hundreds of helicopters. It is not possible to develop relationships with the inhabitants from inside a tank or a helicopter — still less a drone. The Army did not and does not care. During the Vietnam defeat, the slogan was, “If you’ve got ’em by the balls, their hearts and minds will follow.” This is not true. The Army had plenty of opportunity to learn this, since it financed and observed the defeat of the French by the Viet Minh. Yet in 1962, it adopted French methods. The Americans were arrogant. They thought the French had failed because they weren’t real men, like ‘Murricans. Nor did the ‘Murricans have any use for the South Vietnamese armed forces or police. The American officers were uniformly incompetent. It took only three years for the Communists to run the Americans out. Even the despised French had hung on for eight years. There are some omissions in “The Army in Vietnam.” The most serious, but understandable, is the omission of any discussion of corruption in the American armed forces. As anyone who came in contact with the Army in those years will attest, it was pervasive. As anyone who reads the daily papers today knows, it still is.